Chenies Girls played their cricket socks off in a fabulous and tight fought match on a blustery Friday evening. 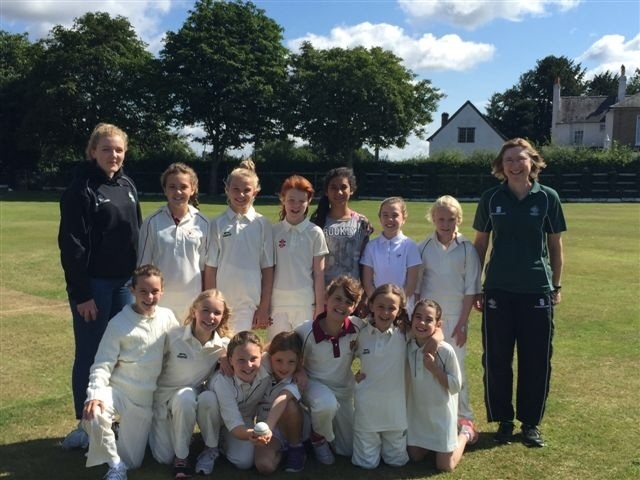 They knocked up an impressive 277 runs losing only 2 wickets, but were pipped to the post by the very experienced Ballinger Girls who got 281 runs in spite of Chenies taking 4 great wickets! Wicket takers were Lucy, Caitlin, Sophia D and Sophie W, but there was some great bowling by all the girls, particularly Amelia and Emily. For some of the girls this is still an introduction to hard ball cricket and so to be bowling the odd Wide or No ball is no disgrace and it is great to see how they recover and improve! There was some great fielding especially from Sophia L who was playing in her first hard ball match and at just 8 years old it was great to see her direct throw back to middle stump sending the bails flying! Others who impressed in the field were Evie, Emily, Caitlin, Sophie and Amelia who were all quick to attack and chase the ball with good arms straight back to the Keeper. There was great Keeping skills shown yet again by Lily, with Emily and Amelia also taking a few overs! Batting top score was Amelia with 2 great boundaries notching up 11 runs in total with Lily contributing 6 runs also including a lovely boundary 4. Emily and Sophie both had 4 runs each with Lucy, Sophia D and Evie providing the rest. All in all it was a great team effort and looking forward to the next match!